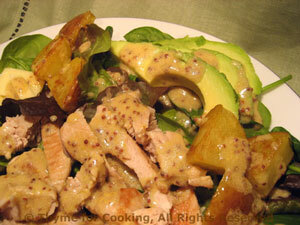 Salad with Potatoes, Turkey, Avocado, from Thyme for Cooking's seasonal menus. We get such lovely turkey cutlets here that I use them often. If you can't find them you can get a turkey tenderloin and slice your own or use chicken breasts or tenders (something I can't get here).